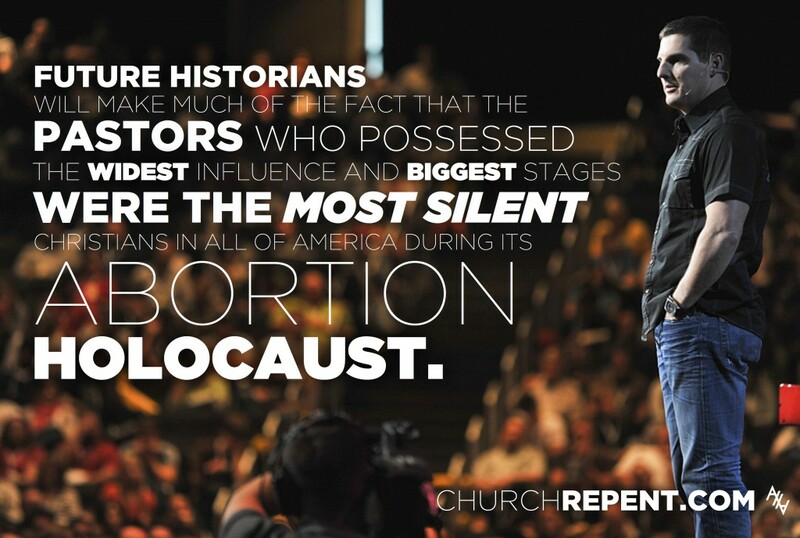 Abolitionists of abortion began privately exhorting the leadership of Life.Church “to love and good deeds” regarding the issue of abortion and the “sanctity of human life” in February of 2013 (Hebrews 10:24). It was then that a long time Life.Church member and former LifeGroup leader in good standing with the church asked if he and his wife could start up a LifeGroup focused on ministering to women caught up in the temptation of abortion and work to rescue babies being “taken away to death” (Proverbs 24:11-12) a mere mile away from their place of worship. The LifeGroup this member wanted to start would have been affiliated with with the Northwest Expressway campus of Life.Church, which is located a mile away from abortionist Naresh Patel’s killing center in Warr Acres, OK. Given the fact that thousands of Life.Church members and visitors meet for worship down the street from a place where their neighbors are being regularly destroyed by abortion… and given the fact that Life.Church possesses the talents and resources to address this issue effectively and willing people wanting to tackle this “love your neighbor” issue with the approval and commendation of their local church, the denial of this members was absolutely shocking. 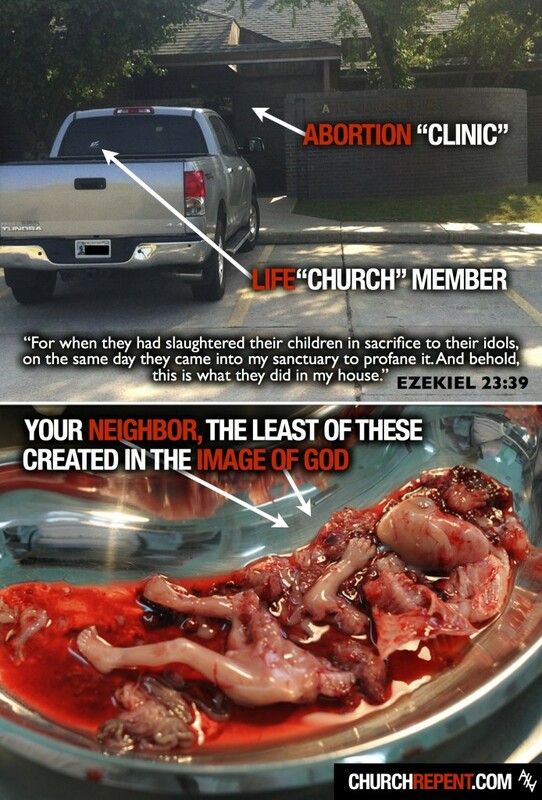 (To read more about Naresh Patel and how he has made a long practice of destroying image bearers of the living God and ripping apart our pre-born brothers and sisters (Matt 25) within the wombs of abandoned women (James 1:27) and has murdered thousands upon thousands of babies down the street from multiple churches (including Life.Church on NW Expressway) and lied in wait for blood (Proverbs 1:11) with little to no opposition from the Christians living and worshiping in Oklahoma City, please go here, and here. 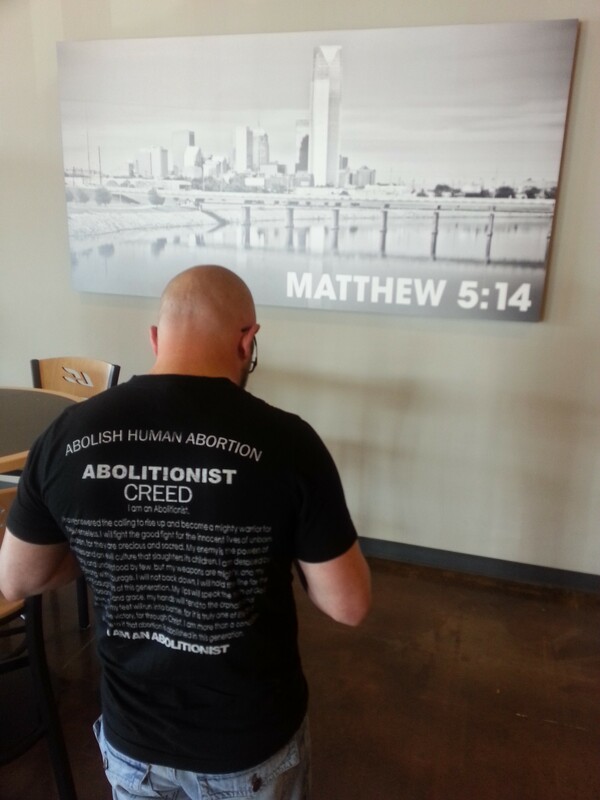 Disillusioned by the response of his local pastor, this Life.Church member shared the emails he received with his friends and fellow abolitionists; members of the Abolitionist Society of Oklahoma (a group dedicated to exposing the evil of abortion and helping women caught up in its destructive path here in Oklahoma). These emails clearly documented the fact that Life.Church’s pastoral staff opposed engaging in any ministry work regarding the “controversial” “political” “issue” of abortion going on within their church. Please read more about these emails here (and if you would like to read them in full please contact us here). After some time ministering to women and men at the abortion clinic down the street from Life.Church and viewing Life.Church stickers on the backs of vehicles patronizing the “clinic” to get abortions themselves, The Abolitionist Society of Oklahoma decided to contact Life.Church by phone and email in hopes of figuring out whether Life.Church even held “prolife” position on abortion, or ever preached against it as sin. We had thought they were a “pro-life” church, but began wondering whether or not they had ever taken any action against abortion and started considering the possibility that “Life”church embraced a policy of avoiding Life issues altogether when it came to unpopular topics like abortion. We found this to be the case. After multiple efforts and run around phone calls with Life.Church staff stationed all over Oklahoma we were finally able to talk to a staff person over the content and scheduling of all LifeGroups meeting in the Northwest Expressway area. She told us that Life.Church did not publicly address the hot button issue of abortion from the stage, that Pastor Craig had never preached on the topic as far as she knew (and she had been “going to Life.Church for a long time”), that LC.TV had no misitries dealing with abortion or crisis pregnancy situations, did in fact deny member initiatives to start LifeGroups dealing with abortion, considered abortion too political to address as a church and while they saw it as a sin didn’t consider it a sin different from the sin of gossip. This Life.Church staff member also informed us that Life.Church members and staff were entitled to their own opinions regarding abortion, that it was not preached against from the stage, and that she knew devout Christians at Life.Church who had chosen to get abortions who were in no way placed under church discipline or asked to repent for this sin (She stated that she could not judge these situations as she had not walked a mile in their shoes, etc etc). You can listen to our phone call with this Life.Church Staff member here. We were appalled by this response and determined that we needed to email them a letter offering to help them get involved in the work of abolition and spiritual and physical assistance of women facing the temptation of abortion or suffering under the guilt of having had an abortion. You can read our email offering assistance to Life.Church here. We did not receive an answer by email or by phone and after prayer, and much thoughtful consideration, debate, and counsel, we determined as abolitionists, to go to the congregation meeting in the Life.Church building on Northwest Expressway and exhort them to love and good deeds regarding their pre-born neighbors in the knowledge that their church leaders were purposively keeping the issue of abortion off the stage and out of the church’s curriculum and small groups. After all of this, we decided to publicly exhort Life.Church’s Northwest Expressway campus in Oklahoma City for ten weeks, standing outside their building with signs and passing out handouts and fliers regarding the seriousness of the sin of abortion and abortion apathy calling on believers at this church to rise up and shine as lights in the midst of the darkness of abortion taking place along the roads they took to church (We take seriously the Parable of the Good Samaritan in Luke 11). To listen through over twenty video recordings of our conduct outside life church and watch some life church members actually go from hating us to appreciating our presence in their parking lot, please visit our youtube page. Please watch through the video playlist “AHA Talking with Life.Church Members” and honestly assess our behavior and message . While we had many great conversations with individual attendees of this mega church organization and have born some fruit engaging people in the parking lot exits and entrances on Northwest Expressway, we haven’t heard a word from Life.Church’s staff, elders, pastors, or CEO. We thus determined to call it good, dust off our feet and focus our time and energy elsewhere .We do not exhort churches because we find it fun to agitate people and we are not so stubbornly committed to casting pearl after pearl before people who are determined to be disinterested or blindly led astray by their guides who disciple them to neglect justice and ignore prophetic calls (Matt 23). Please watch this video message to Life.Church leadership filmed at the end of our final day exhorting the Northwest Expressway Life.Church location. Three days after we called off our public exhortation of Life.Church, abortion abolitionists were standing outside an abortion “clinic” in Norman, Oklahoma pleading with women to hold them back from the slaughter of abortion and ran into a long time member of Life.Church who was taking his daughter to get an abortion. This father told us not to judge, explained that he was a Christian, and that abortion was not the evil we thought it was. This is the fruit of a ministry that refuses to take a bold stand against abortion and fails to instruct their hearers about the sin of child sacrifice. Past Craig Groeschel, this is your fruit. We will have one more post documenting our final exhortation of the main campus of Life.Church later this week and we pray that Pastor Groeschel makes some response to our call to repentance and perhaps sits down with us to explain our errors in dealing with him and his flock or maybe even considers what leading his church in repentance of abortion apathy might take and in turn look like. Please pray for Pastor Groeschel and the Church he has been entrusted to shepherd.